LAS VEGAS, NV--(Marketwire - Oct 31, 2012) - Hannibal Industries is premiering Metalsistem, a shelving solution manufacturer, to the North American automotive market in booth #10185 at the 2012 SEMA Show in the Las Vegas Convention Center this week. 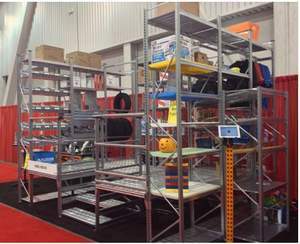 Metalsistem is a boltless, metal shelving system engineered for the automotive market to increase efficiency and productivity for auto parts stores, auto shops and auto manufacturers in the storage of their parts and products. With fully adjustable shelving and excellent stability along with easy assembly, the Metalsistem Super 1-2-3 offers a cost-effective solution available with numerous accessories for the automotive industry. Metalsistem UNIRACK allows excellent load-bearing capacity, and features zinc coating for high durability. This storage system allows two- and three-tier installations. Connect with Hannibal Industries on Twitter @HannibalRack, the HannibalRack YouTube channel and on LinkedIn. For additional information on the Metalsistem products and Hannibal Industries' complete storage solutions offering visit www.hannibalrack.com. The company's industry leading product offering includes Structural Pallet Rack, Roll-Formed Selective Pallet Rack, Hybrid Systems, Cantilever Systems, Pushback Systems, and Pallet Shuttle™ Systems by Autosat®, GlideRack, Pallet Flow Systems, Case Flow Systems and Drive-In Systems. Engineering and design services offered by the company include: system design; seismic engineering; permit administration; in-house installation and custom fabrication. A true innovator, Hannibal Industries was awarded a patent in 2006 for a pallet rack system adjustable safety restraint, and currently has a patent pending for its TubeRack. For additional information, visit www.hannibalrack.com.